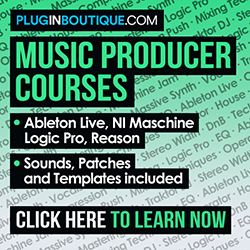 then you’ll be pleased to know that we’ve pulled together a list of 10 tips to help you get even more out your drum machine. The Roland TR-8 really stands out in a darkened club thanks to its brightly lit controls – there are other colour schemes you can select for it though by switching it whilst holding down the PTN SELECT button. Once it starts up, hold down the DEPTH button and you’ll see the Scatter dial light up. To change a scheme keep holding down DEPTH and move the SCATTER dial – you can pick between 1 to 6 for differing light schemes. Just hit START to carry on. The Roland TR-8 has 4 analogue outputs, the two mix outputs and the 2 assignable outputs which you can quickly set to 4 separate outputs. Firstly fire up the TR-8 but hold down PTN SELECT at the same time. each drum sound will route to the MIX OUT as a default, but if you hold down A or B and then your chosen sound’s select button you can assign that sound to ASSIGNABLE A or B. Next you can then hard pan your sound left or right, by holding down the inst select button and twisting the TEMPO dial left or right. 4. Grab 2 new drum machines ! if you haven’t already grab the 7×7 pack – this contains the TR-707 and TR-727 sounds. More juice, we like. You can quickly hard pan a drum sound left or right, by holding down the its instrument select button and twisting the TEMPO dial left or right.